In this Audio Literature presentation, consisting of two audiotapes, Jim Carroll reads his cult classic book The Basketball Diaries, which he wrote between the ages of 12 and 16, from 1962 to 1966. While some diary entries are omitted, most of the omitted ones are available on the Dial-a-Poem albums. This recording is a must-have for fans. Carroll's reading is about as close to a live performance as one can find on an "official" recording. 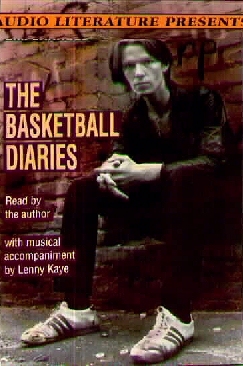 Guitar tracks by Lenny Kaye (guitarist for Patti Smith and The Jim Carroll Band), with basketball dribbling samples as a rhythm track, provide a rich continuity between the diary entries and sections. The cover photo is from the same photo session as the cover photos on the 1980 Bantam (2nd) Edition and 1998 (5th) edition of The Basketball Diaries.